My name is Tuan Nguyen. Do you remember [things] around 1968? 1968? At that time, I was only in 9th or 10th grade. 10th grade in high school. Were there any bombings around where you used to live? We could hear it [the bombings]. When I was young we can hear them. We were in Saigon. Now we call Ho Chi Minh City, right? We could hear, we can hear the sound at night. The [Saigon] city was okay, but sometimes, but random. They were shooting from the village. They terrified the people in the city. What were you doing before you joined the military? I was a student. I just graduated from high school and I registered at the university. What did you study [in college]? Attorney, law. Then they had the draft, and I had to go into the military. If you do not get in the university like the medical school, pharmacy, and architecture, then you had to go to the army. But I cannot get in, I don’t have time to get in. I had to join the army. Were you 19 when [when you joined]? Yes, that time I was 19. I started training around September 23, 1972. I do not complete it [my training] until October 1973, then I graduated [from the military academy]. Then I went to the field. We tried to learn the basics in the military, like how to use the guns, how to go to the field, patrol and all kinds of stuff during training. We were trained for about a year, then we went to the village. I never had a face to face battle. One time, we all slept, we were in the field, all day all night. We tried to check out the area. And they had guerrillas on the other side. They hit our unit or company on the other side, but not my side. When did you become a Second Lieutenant? A: Let me see. Around February, 1975. Only about a few months later the war ended. So you said when you started there were only 1000 soldiers in the troop? Yes. Over 20 camps, right? One thousand [soldiers] and seventy or eighty. Something like that. After I became the Second Lieutenant, after two years, we had only 600 [soldiers] left. The others got killed, died. Even though the war was already over? Yes, even though the war was not as violent. But, be careful, in late 1974, they escalated, because from north they went to south. Because the US was not there much anymore? Year, [we got] no help any more. Every time we shot with the gun, when we had to support the bridge from the enemies, every few minutes the whole unit had to shoot with our guns and throw grenades we had to count [the bullets] and we had to keep the shell, after the year 1973. Every bullet you find you had to keep the shell. Then we gave it back to our commander and they gave us new bullets. They don’t have support anymore from the United States anymore. They are very rare. And that’s it. At that time over there, the U.S. Congress cut a lot of money to South Vietnam. And our team, the United States, and the North side supported by the Russian and the Chinese they got agreements and they withdraw from Vietnam. They let the Communist to take over. That day, Saigon was very, you know, not that stable. They got the battles around Saigon already, right? That day I asked my commander to back to Saigon. And that time we were only about, let me see, 10 miles or 15 miles away from Saigon. When I tried to go back there to my post, there got the bombings. I cannot get out of there. That was April 28. I had to stay home and wait for it to calm down. On the 29, I got a cousin, [who was] the captain of a ship. They were going to another island outside Saigon. There were all kinds of bombings [in Saigon]. You had to get out of there. If you don’t get out of there, you know [the consequences], there was big battle. So everyone tries to get out. On April 29, 1975, we left with a Navy ship. Yeah, with my mother, another cousin and other relatives. We were going to the Subic Bay off Philippines. From there, all the Navy ship were going to the Subic Bay. From there, we [boarded] a big ship. [This ship] transferred us from Philippines to Guam. Were there a lot of people in the ship? Yeah. Let me remember, at that time, in that event around 130,000 people getting out of Saigon. In the ship you were at, were there mostly people in the military or were there a lot of civilians too? Oh, they mix. They got some Army, some Navy, some Marines and some Pilots. Because at that time, the South Vietnam, Saigon collapsed. So everyone tried to get out. No, if you are lucky, you can get the family, the whole family. I was lucky, because I got only my mother, so I asked and she came with me. We were lucky. After 6 days and 5 nights on the ocean, we got to Subic Bay. Then we transferred and did the paper work. We transferred to a big ship. Was that a US ship? Yes, now we became Vietnamese refugees. And we’re going to the US. At that time, we’re leaving and transferred to the big ship. We left Subic Bay and we went to Guam. It took 4 days to Guam. How long were you staying in Guam? About 3 or 4 weeks. Were you in a refugee camp in Guam? Yeah, that [place] was called Orote Point. They got a camp. They made a tent for everyone. It was fun. Everyone was happy. It was fun, yeah. We went to some agencies that helped us to find sponsors. There was a sponsor, a Lutheran church, we got a family sponsor, let me see, in Moweaqua, a small town in Illinois. [Moweaqua] got only 1600 people, a small town. My mom and myself went to Moweaqua, to stay there. Were your cousins and uncles not with you? They went to other camps. When we’re going to the in-town gate, they got a lot of people over there [to be arranged]. If you want to get out soon, some family have to split up, because some church, they cannot sponsor a whole [family]. They can take a few people [in a family]. They can take a family. The crowded families usually waited until the last. So you and your mom. Because there’s only two of you? Right. At that time, not only the United States [were accepting refugees]. Everyone [other countries were accepting refugees too]. But the US was the good one. This entry was posted in ARVN, Refugee, Vietnamese. Bookmark the permalink. Tuan Nguyen was born in Vietnam in 1953. He graduated from high school and started studying law in Sigon. 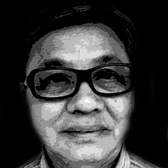 However, Tuan was drafted in the ARVN in 1972 at the age of 19. After serving in the army for about one and a half years, Tuan moved up to become a Second Lieutenant in February 1975. Tuan fled Saigon with his mother and other relatives in April 29, 1975 with a US Navy ship. Tuan made several stops before he settled in the US. He stayed at a refugee camp in Guam, where he found a family in a Lutheran Church that sponsored him and his mother. Tuan was assigned to a small town in Illinois at first. He moved around the country for several year until he settle in Souther California. He got married in 1991and had one daughter and one son. Sofia Cuellar studies International Relations at USC. Dan Li majors in Business Administration and is an active member of Undergraduate Student Government. Ben Benet is a GeoDesign major and Environmental Studies minor. Yuping studies Business Administration at USC Marshall.